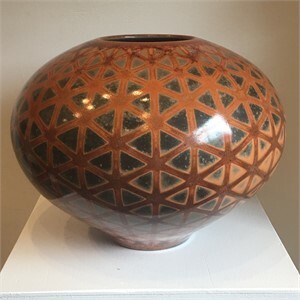 Jim Whalen, a North Carolina artist who has been working with pottery since 1971. "My pots are wheel thrown, burnished and sprayed with terra sigillata. The pots go through a two stage firing process. First, a low temperature salt firing is followed by a saw dust firing. 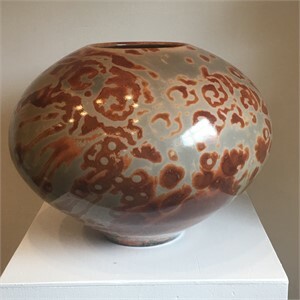 The patterns are created with wax resist after the bisque firing. This is a unique process that I invented some 20 years ago. There are no glazes. All the coloration comes from the 2 firing process. The final step in the process is to coat the pot in Tung oil varnish which protects the surface and enhances the coloration. These pots are not meant to hold water. They don’t function, they operate in the same way that abstract paintings do only in 3 dimensions." 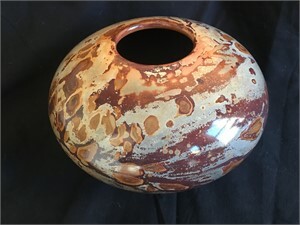 "Both salt and sawdust firing create random chaotic markings. By combining both on a pot separated into distinct areas by wax resist I’m creating order without destroying the vitality of chaos. My work looks natural because the forces of nature are so involved in their creation. My inspiration comes from inside, my influences are the sky and the ever changing surface of the pond." 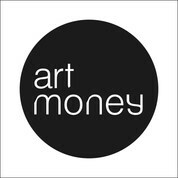 We partner with Art Money. Enjoy now, pay later. Art Money is available from $1200 to $50,000. If you love art, you’ll love Art Money.